We have all heard strange stories about China’s presence in Africa. From the New AU’s- African Union– headquarter to a collapsing hospital in Angola. For instance, I am thinking of this story I read on New African – The biggest-selling panAfrican magazine in English– that Chinese expatriates were eating the stray cats and dogs of the neighbourhood. Frankly, why is this kind of story reported anyway? Is this some kind of character assassination? Or worse sabotage by you know who ? To compound the matter, last year I saw a lot of ads sponsored by the government of China on TV and magazines. Apparently, they were trying to rebrand China. Very confusing Indeed! The major question here I think is: What is China exactly doing in Africa? What does it mean for us Africans? And for the world? Luckily, my favourite economist decides to write a book and answers these very important questions. The Truth of the matter is that the reasons for China’s presence in Africa are far from obvious. There are a lot of contradictory reports and articles in the news. However, China is on a shopping spree and Africa with its huge reserves of commodities (oil, water, land, gas, gold,minerals…) is an obvious “shopping center” literally. But first, as usual, a word about the author. Dambisa Moyo is an international economist and author. She shot to stardom after she wrote “Dead Aid”, where she argues that Aid is actually nefast to the development of Africa. Her argument is based on the idea that throughout history no nation has developed on aid only. She advocated for more foreign direct investment and trade. This point here links directly to her attitude toward China. Indeed, Ms Moyo is a pro-China advocate. On a recent event I attend she said “…Chinese are our friends…” but more on this later. Winner Take All: China’s Race for Resources and What It Means for the World (June (2012). Dr Moyo holds a Doctorate (D.Phil.) in Economics from Oxford University, an (M.P.A.) from Harvard University’s a (M.B.A.) in Finance and a (B.S.) in Chemistry from the American University in Washington D.C. Subsequently, she worked for the World Bank as a Consultant and at Goldman Sachs as an economist in the global macroeconomics team on the debt capital markets sector. According to Investopedia, a market where the Winner take all is a market in which the best performers are able to capture a very large share of the rewards, and the remaining competitors are left with very little. The main argument of this book is that the commodity market is a winner take all type of market and China is extraordinarily well-positioned to capture a very large share. It is indeed very worrisome, not because it’s China, but because we know with certainty that nothing good come out of a monopoly situation. 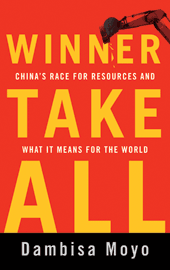 Winner take all is divided in two major parts: The first part discusses China’s rush for resources and the second part discussed the implication for the world. The focus of this book is not Africa per se but rather China and it huge needs for resources. Since Africa is a main supplier in the global commodities markets, Africa’s commodities situation is covered in great details. In this first part, the author introduces us to the reasons why China is so hungry for commodities. China has been growing at a double digits rate these last years and it is set to grow at around 8% in 2013. With these phenomenal rates, China’s middle class is increasing and is demanding standard of living close to those of the West. Basically, it means more cars, homes, roads, food, water, oil…After the drivers of the world commodity demand are explored, each major resource – Land, water, oil, gas and minerals – is covered extensively . For each resource, the supply and the demand side are analyzed but the author constantly keeps China and it need of that resources in perspective. For an economic book, it is absolutely easy to understand and arguments are supported by a lot of statistics and graphs. The main argument is that natural resources are finite and that, at the extraction levels the world is going, we are heading for a war of some sort that nobody except China is ready for. China is planning for the time of scarcity. This claim is supported by a lot statistics on the actual commodities markets and the fact that new reserves discoveries are much rarer now and not easily accessible.The author also discusses the fact that new technologies have delayed the day of reckoning. I really enjoy the first part, it was full of surprising facts and quite fascinating. I really appreciate the fact that the author stayed objective, even though she is pro-China. She nevertheless took the time to explore the pros and cons of each issue. This is the best part of the book and the most important chapter of this book is chap 8: The Geopolitics of All. All the questions I mentioned in the beginning of this post are answered in this very chapter. In chap 5&6, Dr Moyo explores the mechanics of the commodities markets and how China’s actions is distorting markets prices. I think she did a great job of keeping things simple and easily understandable. Is China trying to implement some sort of Neo-colonialism in Africa? …China appears wholly disinterested in assuming sovereign responsibility or in shaping the social and political infrastructure of the host nations…(P 157) …If anything, China should be criticized for being too disinterested ..
Is an army of Chinese labourer descending on Africa or is it another myth? Is it true that Chinese companies don’t hire local staff? Is it true that Chinese workers in Africa are prisoners on work-release programs? What of the Labor Abuses? A lot of nasty stories abound? Also, Dr Moyo stresses that contrary to common belief, local population are not against China’s presence in Africa. (this is according to a Pew survey conducted in 2007). Five years on , she said that we don’t have any reasons to believe that things have changed. When will China start to throw its weight around? When exactly is the tipping point? By asking this question, Dr Moyo is reminding us that China is now a military power. What if an African country try to deny China access to a resource it wants? I absolutely recommend you this book. Even if it takes you forever to finish it, I think it is worth it. Thanks for the review, I haven’t read Dambisa Moyo and I believe it’s time I do. I’ve added it to my list of summer reading.